Lunar Battle: Making Of : On5. We make mobile games. Lunar Battle, the game our studio made for Atari, is finally out! We posted a teaser on it earlier, but now it’s fully available worldwide on the AppStore and Google Play. In this game you help the crew of a crash-landed spaceship build a colony on an asteroid in distance space and fight space pirates. You start with a really small colony and just a few essential buildings, and eventually develop a pretty decent settlement, producing a variety of food from soup to pizza, and drinks from juice to wine. Pump acid from acid lakes to make batteries for electric cars. Mine copper to produce obsolete electronics. Fight aliens with blasters you are going to produce. Fight pirates with the spaceship you build. The game has it all. We’d like to tell you about the process of making the game, show working sketches, and how the game came to be what it came to be. We previously did that with Spice Bandits and Roller Coaster Tycoon 4 Mobile. It all started with sketches, a huge number of sketches. We tried to find the best style for the general look of the game. Then we picked the most interesting and eye catching variants. We decided to make the asteroid orange (like Mars on NASA pictures) so that the overall image is vibrant. The time of day (like there’s such thing on an asteroid) is something like the “golden hour” when the sunlight is somewhat red. Yep, even more of red. Sketch after sketch, and discussing the steps with Atari, we found the final look for the buildings. Then we started working on the Asteroid itself. It’s huge. In the images below you can get an idea of how huge it is. Buildings everywhere, menacing alien hives, cliffs and ramps. When playing the game, check it out: each and every asteroid settler has its own name, portrait, and life priorities, even their own mood. We’ll show more of the asteroid below. Of course, each colony dweller not only works, breathes, eats, drinks, and sleeps. Their most important duty is to be properly displayed! There were more than these two designs but none were fitting. We had both very nice looking characters, which however didn’t quite match the setting, and ones that matched the setting perfectly but looking weird. By trial and error (not just what we show here) we decided to pick this visually simple option for the peeps. 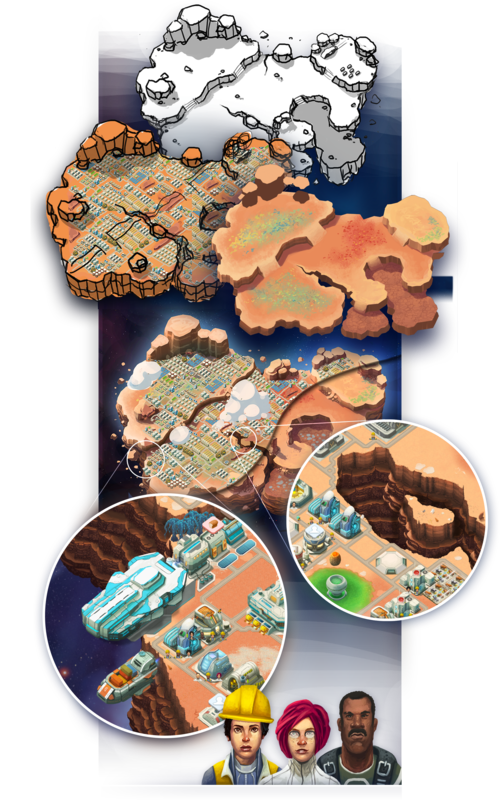 A worker, engineer, and a scientists are very easy to tell apart on the map even when zoomed out. 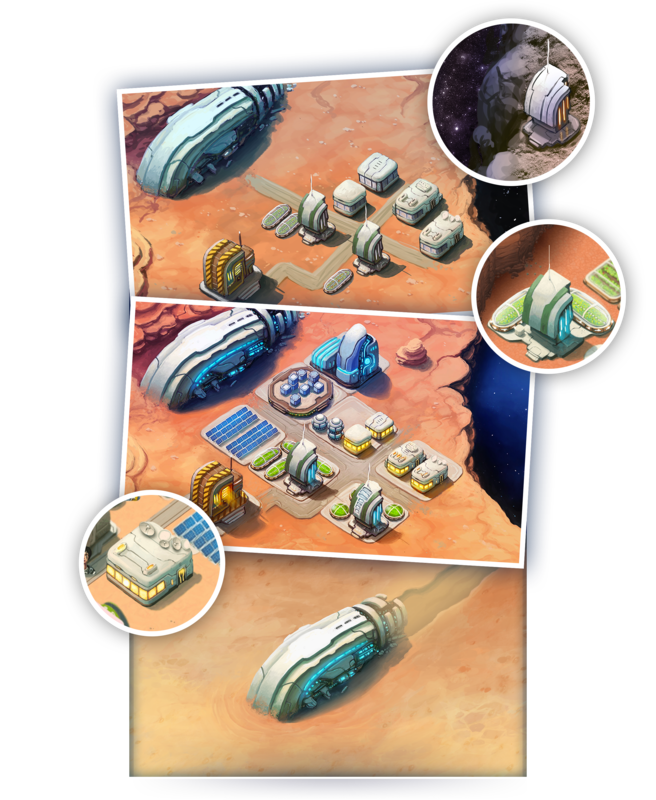 The colony population is ever growing, each settler breathes, and almost every building uses energy. It’s all vital information, which should be available at a glance in the main HUD. Here’s what the HUD icons looked like before the final stage. The first option was just something to test gameplay with. We experimented with shapes and colors, and finally picked green for oxygen, blue for energy, and spacemen for the colony population indicator. In Lunar Battle you can also create a custom spacecraft to battle hordes of space pirates, or other players online. AHOY! Below is the ship configuration UI. You use this interface to customize the equipment of your spaceship. This is what it looked like in the test stage, and what it is in the final version. By testing the temporary version, we managed to polish it and make it what it’s supposed to be like. Back to the asteroid map. As we wrote, it’s pretty huge. Large maps are usually problematic on mobile devices. Either it would use a lot of memory if we made it a huge image, or it would look boring and monotonous if we made it of repeating tiles. 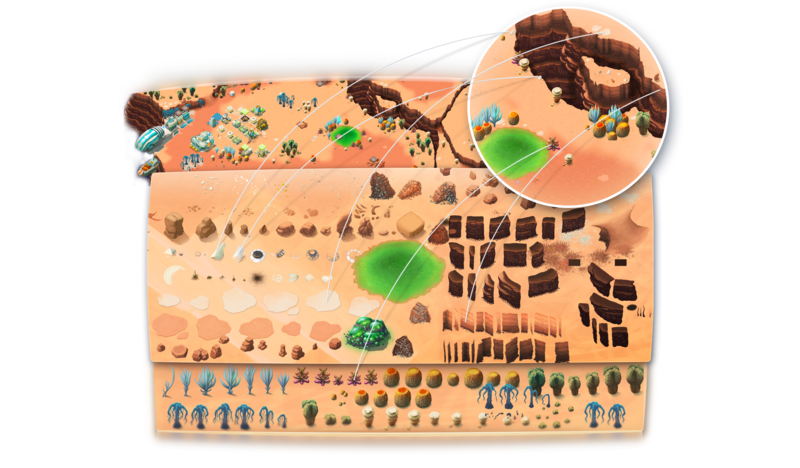 We used the classic approach from earlier days of game programming where we assemble the map from small bits on the fly. On the image below you can see how a set of simple sprites makes up the landscape: both huge and unique, and not visually boring at all. The game features not just colony building and space battles: there’s a story too. You are in charge of space travellers from Earth who crash-landed on an asteroid. As you progress through the campaign and building the colony your team is always there to chat and point fingers. It’s the moderately competent captain, passive-aggressive engineer, demanding scientist, confident cook, the ship AI who doesn’t make assumptions that you might be human, and others. 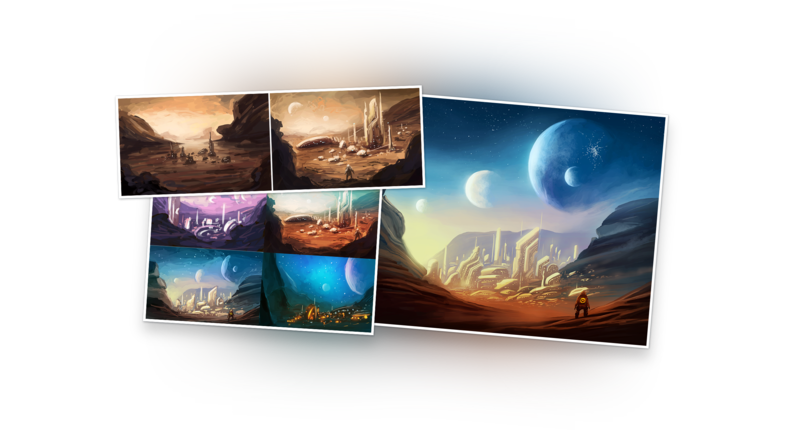 There’s a bunch of space crooks you are going to meet as well. 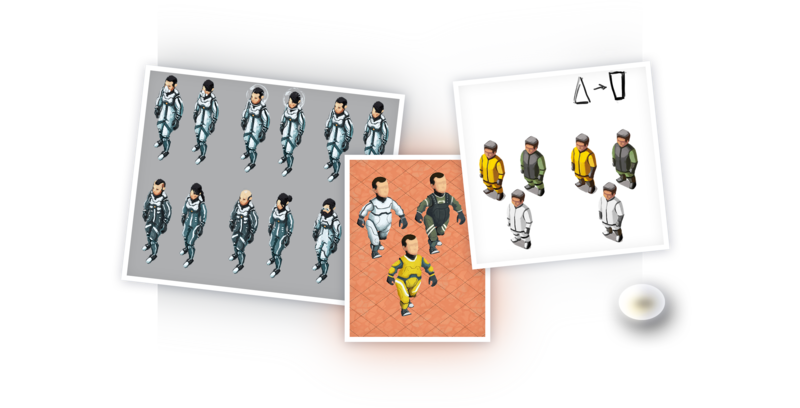 Below you can see the game’s title artwork and its sketches and variants. You’ll see this image when you launch the game. Apart from the loading art, the game uses a number of cutscenes. 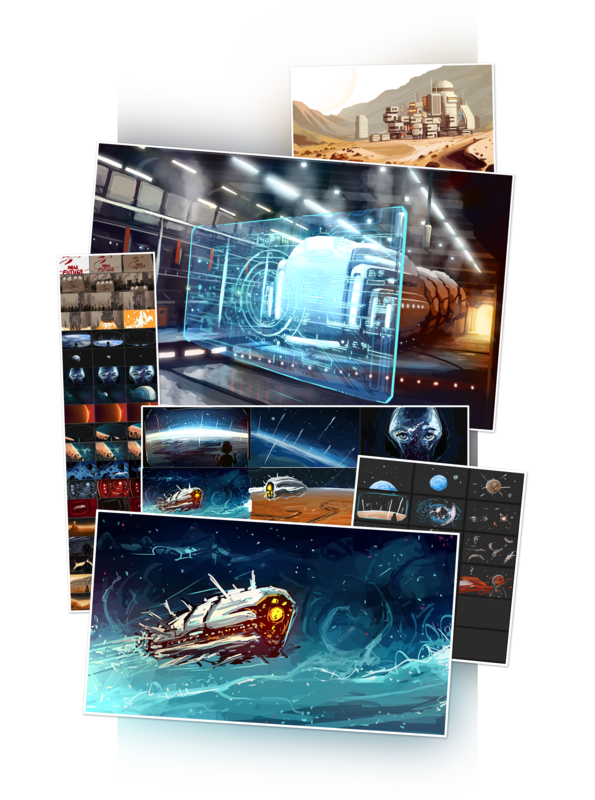 We also happened to sketch and create a large amount of artwork which was not used in the final version. See the little mash-up below. You can see all this art in its final form in the game when you play it. If you liked our story, share it with your friends and followers. Make sure to check the game out and try yourself in space colony management and space battles, the truly essential skills for any 22nd century man. Be sure to subscribe to Lunar Battle on Facebook and Twitter! Hey, I love playing your game, but I have an issue. At one point, it said how to get colonists like scientists and engineers, but I can’t remember hiw to get them. Lookin online didn’t help, so maybe you could include a window for all the important info. Thanks for your time, and keep makin Lunar Battle awesome! You receive a quest detailing all the requirements to upgrade a house. All the details are there. I really enjoy the game, but we need a way to trade premium parts in the marketplace things like graphene, etc. How the hell do I get my workers to make more bread? I have lots of water and wheat but it says 0 production a day, even if I disable all buildings.